This adorable, sustainable garden planter is hand-crafted by artisans in the Philippines. Hedgehogs are typically nocturnal animals, but this guy? He can't wait for the sunrise every day. That's because his coat is a place for plants to live. 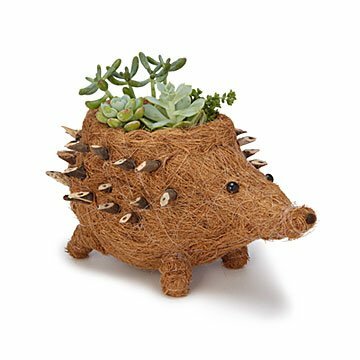 Celebrate his natural state with a prickly succulent or cactus, or fluff him up with a fern or zinnias. Whatever greenery you choose, you'll feel rosy knowing these planters are hand-crafted by artisans in the Philippines using native coconut coir fibers. To ensure a longer life span, use pot or liner to keep the planter dry.